BPP University Law School has cut the number of staff at its Waterloo campus, Legal Cheek can reveal. 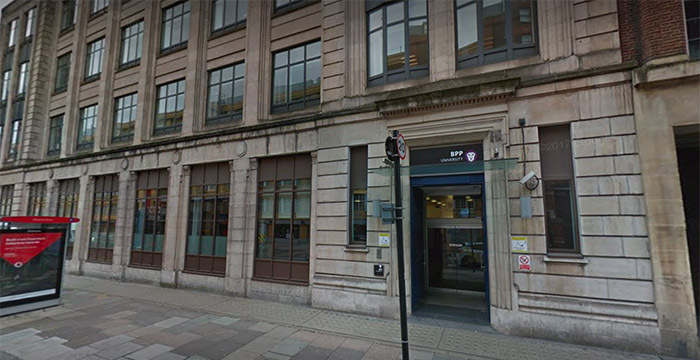 The redundancies come just weeks after the legal education giant confirmed it was suspending its LLB offering to focus on developing a host of new solicitor super-exam programmes. News of the staff exits come as the profession gears up for huge changes to legal education, most notably the Solicitors Qualification Exam (SQE) or super-exam. In May, we revealed that BPP was suspending the intake of its undergraduate law degree. At the time, BPP’s director of business development, Tricia Chatterton, told us that the law school has “clear plans for the future” and that “now is the time to turn those plans into a reality”. Chatterton was unable to say how long the suspension would be for but did stress there are no plans to scrap the LLB at BPP outright. Students on the law school’s solicitor apprenticeship programme — which incorporates a purpose-built LLB — aren’t affected. As the super-exam’s anticipated 2020 implementation date draws ever closer, at least three universities have gone public with their plans to integrate SQE content into their LLB courses. London South Bank University told us that it’s planning to teach an “SQE-facing” law degree using super-exam-style multiple-choice questions to test students’ knowledge in a legal practice context. Meanwhile, in a recent interview with Legal Cheek, University of Law chief Peter Crisp confirmed that his institution was in the process of creating an LLB that is SQE compliant. A type of lawyer we have in the UK. Someone found on the top floor of a shiny glass building near Bank/Liverpool St station, or on Kings Cross street corner. Either way, if they’re any good at what they do you will not be able to afford their hourly rate unless you have a corporate card. Unfortunately I did the LPC at BPP. What an utter sh*thole. I did the LPC at Ulaw. Also shite. I don’t think the course lends itself to being taught well. I previously did the ULaw LPC as well. These are for-profit institutions managed for greedy owners by failed/burnt-out lawyers. It’s guaranteed to be a failed delivery mechanism. I made this argument years ago: Make the LLB programme mandatory for those wanting to become a lawyer. Integrate the BPTC and LPC into the LLB to make it a 4 year undergrad (with less room for “easy” options outside of the law faculty). For career changers/undergrads from other programmes looking to switch, provide the option for a 3 year LLB (or even call it the JD) which would basically be the GDL/LPC/BPTC. All options administered by public universities and monitored by the BSB and SRA for accreditation purposes. This way wannabe barristers that are brilliant advocates naturally are not scared away by the insanely expensive BPTC and instead candidates are filtered out only by the recruitment processes of chambers (and firms). I did the BPTC at City. Also shite! Way worse than BPP too. Unfortunately I did the GDL at BPP. Unfortunately I did the LLB at BPP. What an utter sh*thole. Unfortunately I did the BPTC at BPP and they still haven’t released the results – they’ve sat on them since March. Not fit for purpose and should be shut down. Hopefully BPP and other private equity firms will go bust soon. Universities should be charities, and charge no fees. A supertax on city law firms to fund the NHS! Universities are already charities, they were set up by royal charter. Some like BPP and Ulaw aren’t. But still 9k and they call you asking for a charitable donation. Just completed the GDL at BPP. A complete and unmitigated disaster. Easy as chips if you aren’t a moron. I completed the GDL and accelerated LPC at BPP Waterloo and Holborn. The facilities weren’t great (always either stifling hot or freezing) but by and large the teaching was good quality. That these highly compressed courses aren’t fun isn’t surprising, giving they are tailored to getting you into practice ASAP so your firm can start making £££.